In the summer of 2007, a mid-sized, open admission animal shelter in a suburban town started noticing an increase in canine respiratory infections. It wasn't long before the infections became more severe and widespread - even affecting pet dogs in the community. Then dogs started dying. After months of trying to control the outbreak, hundreds of lives were lost and every dog in the shelter was euthanized in a final attempt to control this devastating disease. The culprit? Canine distemper virus. Such an event is devastating to any community, its sheltering organizations, and pet owners. Unfortunately, this is an all too common scenario. You might be thinking, with all the advances in medical care and technology in today's world, how can a disease that has been around for over a century still result in such a devastating loss of life? Isn't there a vaccine for that? The good news is there is a vaccine for canine distemper virus and many other serious diseases that impact animal shelters on a daily basis. The bad news is that vaccines are sometimes less effective than they can be simply because they're not stored, transported, or handled properly. As long as a few simple rules are followed, vaccination can be the life-saving tool it was designed to be. Most of the vaccine products used in animal shelters and veterinary hospitals are made up of living, infectious organisms (see Table 1 for Types of Infectious Vaccines). As such, they are extremely sensitive to both extreme temperatures and fluctuations in temperature. When a vaccine shipment arrives at the shelter, it should be unloaded as soon as possible (i.e., within 1 hour) and inspected to be sure the shipping container is intact, the product packaging is sealed and the ice packs are cold. If any of these things are not in place, the vaccines may be compromised and should not be used. The distributor should be contacted immediately and, in most cases, will send a replacement shipment at no cost to the shelter. Once unloaded, vaccines should be stored in a refrigerator maintained at 35-45°F (2-7°C). Temperatures higher or lower than this range can result in the death of the living vaccine organisms, leaving the product ineffective. A refrigerator thermometer should be placed in each location where vaccines are stored to ensure the appropriate temperatures are being maintained. Temperature monitoring is especially critical in warm environments and busy shelters when the refrigerator is constantly opened and closed to access the vaccine products. A system for recording the temperature of the refrigerator at different time points throughout the day will help keep track of fluctuations and allow refrigerator settings to be adjusted to maintain a temperature within the desired range. Many shelters may find the need to transport vaccines from their storage refrigerator to another location for administration. Or, in an attempt to improve workflow efficiency, many shelters and spay-neuter clinics will prepare vaccines at the beginning of the day and set them on a cage top, carry vaccine products in vehicles, and store them on counter-tops in the intake wards. All of these practices jeopardize the vaccine product's effectiveness and place the shelter or clinic at risk for a disease outbreak. Unless they are being prepared for immediate administration, any time vaccine products are removed from the refrigerator they must be placed in a cooler with ice packs. The vaccines should be administered, or the ice packs replaced, within 1 hour. Shelters are often the recipients of donations of short-dated or expired products - many of which can be safely used in the shelter environment. Unfortunately, expired vaccine products are not included on this list. Careful attention must be paid to the expiration date printed on vaccine products to ensure that they remain effective. The longer a vaccine product is used past its expiration date, the less we can be sure about the vitality of the living organisms in the product and their ability to induce a robust immune response in an animal. In the case of rabies vaccines (which are non-infectious, inactivated, or killed products), administration of an expired product will not be legally valid. Vaccine products are available in two basic forms: ready-to-use, multi-dose vials (also known as "tanks"), and single-dose vials. The only products available in multi-dose vials are non-infectious (or "killed") vaccines, such as those for rabies virus and the injectable canine Bordetella bronchiseptica vaccine. Although they offer a level of convenience, multi-dose vials carry a greater risk of contamination since the stopper is repeatedly penetrated with needles to draw out the product. If used, they should be shaken before drawing up the vaccine to ensure even distribution within the vial, and they should be discarded if the rubber stopper becomes compromised. All infectious vaccine products undergo a freeze-drying process known as lyophilization, and must be mixed with a sterile diluent prior to use. Using sterile technique, the sterile diluent is injected into the lyophilized vaccine product and allowed to thoroughly dissolve before the product is drawn up into the syringe for administration. This process of rehydrating the vaccine is known as "reconstitution". Many types of sterile diluents are product-specific, so these should not be interchanged or substituted with another product or solution. Most manufacturers will provide additional sterile diluent at no charge in the case of lost or missing vials. Once a vaccine has been reconstituted it should be administered within 30 minutes and protected from temperature extremes as discussed above. Multiple vaccine products should never be mixed with one another and doses of vaccine should never be split between animals - kittens, puppies and full grown adults require the same volume of product in order to develop the immune response that we expect. The empty vaccine vials should be discarded into a regulated medical waste container (e.g., a "sharps" box) for proper disposal. Prior to administration of any medical product, the route of administration as indicated by the manufacturer should be double-checked. Administration of the product via an incorrect route can result in inactivation of the vaccine, clinical disease in the animal, or at worst, severe organ damage and death. For example, subcutaneous vaccinations given intranasally will usually result in inactivation of the vaccine, whereas accidental injection of the intranasal Bordetella bronchiseptica vaccine can cause acute, severe liver failure in dogs. 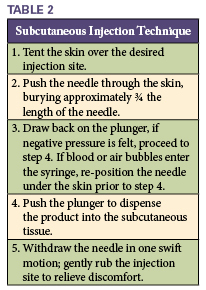 Cleaning the skin with an alcohol swab prior to injection is neither recommended nor necessary. Alcohol is not an effective disinfectant when used in this manner and could inactivate the vaccine if it makes contact with the infectious organisms in the product. A final consideration regarding vaccine administration is the location of the injection. Choosing a standard site for administration of vaccinations is a best practice and, in the event of a local vaccine reaction, will provide a clue as to which product may have caused the reaction so future precautions can be taken. The location chosen is not as important as using a consistent location within your organization and documenting the type of vaccine and its location in the animal's medical record. Most commonly, canine distemper-parvovirus (DAPP) and feline upper respiratory-panleukopenia (FVRCP) vaccines are given in the right foreleg, rabies vaccinations are given in the right hind leg, and products containing feline leukemia virus (FeLV) are given in the left hind leg. Ideally, all products should be given as far down the leg (below the elbow or knee) as is feasible. In the case of animals that are unaccustomed to being handled or when one person is both restraining the animal and giving the vaccine, this may not be possible and administering injections in the scruff is usually the safest and easiest choice. Perhaps the most common "complication" associated with vaccine administration is a mis-injection - the animal moves during the injection, the needle is accidentally placed completely through the skin and out the other side, etc. Whatever the cause, the result is that the entire dose of vaccine did not make it into the animal, ending up on his or her fur, in the environment and on the handler. Whenever there is a question as to whether or not an animal received the full dose of vaccine, the vaccine should be re-administered. Since most of the products used in shelters are infectious or "live" biological products, care must also be taken to clean any spills. Vaccine that ends up on an animal's fur should be cleaned with an alcohol swab, while any that spills onto the table or floor should be cleaned with a disinfectant with efficacy against non-enveloped viruses (e.g., 1:32 bleach solution, potassium peroxymonosulfate, accelerated hydrogen peroxide, etc.). Any vaccine that ends up on the handlers can be eliminated by thorough hand-washing with soap and water. Not attending to vaccine spills in this manner could cause illness in the animal and promote the transfer of infectious diseases throughout the shelter. The most common complications that result from vaccine products themselves can be broken into two categories: local reactions and systemic reactions. Local reactions are most common and typically appear as lumps, pain, swelling or hair loss at the injection site within hours to a few days after injection. These reactions should be documented in the animal's medical record but typically resolve on their own without any specific treatment. 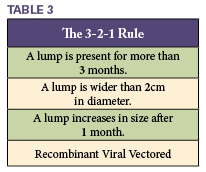 The 3-2-1 rule is a good method for identifying local vaccination reactions that should be evaluated by a veterinarian and for which treatment may be indicated (see Table 3). Systemic reactions can range from mild, self-limiting signs of illness to severe, life-threatening anaphylactic shock. Mild signs, such as lethargy, anorexia, fever and soreness typically resolve in 1-2 days without any treatment. If these signs persist for longer than 2 days or become progressively worse over the 2 day period, the animal should be evaluated by a veterinarian. The use of intranasal vaccinations can cause mild clinical signs of disease (e.g., sneezing) in a small proportion of animals; these signs usually disappear within 3 days after vaccination. Signs of a potentially severe reaction that warrants immediate veterinary evaluation include persistent vomiting and/or diarrhea, facial swelling, hives, seizures, collapse, or difficulty breathing. These signs can occur anywhere from a few minutes to a few days after injection. Everyone administering a vaccine in the shelter should be trained on how to recognize these signs, as well as who to notify in the event that a vaccine reaction is suspected. When systemic reactions are identified early, they are typically easy to treat with inexpensive, readily available medications such as antihistamines and anti-inflammatories. Future vaccination of animals that have a history of a vaccine reaction should not be undertaken without veterinary guidance; a change in vaccine product, pre-medication with anti-inflammatories, or antibody titer evaluation may be recommended. As with any medical procedure, administration of a vaccination should be thoroughly documented in each animal's medical record. Proper documentation of medical procedures is important for many reasons, including legal proof of vaccination status (i.e., rabies), monitoring adverse reactions, informing adopters and their veterinarians of the pet's vaccination status, determining future vaccination requirements, and auditing of medical protocols should a disease outbreak occur. At a minimum, the following information should be recorded in each animal's medical record: date of vaccine administration; name of person administering vaccine; product name, manufacturer, lot or serial number, expiration date; and the route and location of administration. Much of this information is found directly on the sticker labeling each vial of vaccine. This sticker can be removed and placed in a consistent location in written medical records. Many computerized medical record keeping systems will automatically populate this information each time a vaccination is given in order to simplify the process. In the case of a vaccination complication (such as local or systemic reactions, failure to induce immunity, reaction due to inappropriate vaccine administration, etc. ), the incident should be reported to the product manufacturer as well as the Center for Veterinary Biologics at the United Stated Department of Agriculture. Vaccinations are truly among the greatest, most cost-effective tools that are available to shelters to enhance the health and welfare of the animals entrusted to our care. They can reduce the severity and duration of the most common diseases that many shelters fight on a daily basis and, in some cases, prevent infection altogether. When used properly, vaccination can prepare animals for a successful shelter experience and promote a lifetime of good health. For more information on vaccinations as well as specific protocols recommended for shelter animals, refer to the 2011 American Animal Hospital Association Canine Vaccination Guidelines and the 2013 American Association of Feline Practitioners Feline Vaccine Advisory Panel Report.